It’s important to state that before a spirit embodies, he chooses the planet, the place, the family and the vicissitudes he will have to confront during his life in the physical plane. Some of these circumstances are very hard and many times the incarnated spirit doesn't stand them and he commits suicide, realizing afterwards that he has to embody again to confront them successfully again, but now under worse conditions. This happens because the 10% spirit does not have reincarnative memory and he doesn't know that those painful circumstances are in fact those that will set him free and part of a lesson he has to learn in order to evolve. WHAT DO THE MASTERS OF LIGHT SAY ABOUT EUTHANASIA? Interlocutor: Before to conclude the session I want to ask you about the case of Terri Schiavo, a woman who has been in coma for 15 years. Interlocutor: The concrete question is if a woman who is in vegetative state, has her 10% spirit incarnated yet or if there is nobody there, I say this in a very illustrative way. Ruanel: This spirit has not disembodied, so she still has her 10% incarnated. Interlocutor: Is she alive then? Interlocutor: I don’t know her case and the cause and I ask you now if she doesn't have what medics call "brain death." Ruanel: No, not yet because her brain continues working. Interlocutor: Should she be maintained, then, in that vegetative state, without doing anything so that she disembodies? Ruanel: A karma would be created if something were made so that she disembodies. As long as the spirit is in the body, the correct thing at medical level is to keep her alive even though if it is by mechanical means. Interlocutor: Is there some possibility that she recover herself? Ruanel: No, there is none. Her mental decoder is totally damaged. But there is no brain death. Then it would be a murder if they remove the apparatus that keeps her alive. Interlocutor: Is there an obligation to keep her alive by means of these apparatuses? Ruanel: From the moral point of view, if a person has health problems, the doctor has to do the impossible to correct that problem. If a baby whose vaccination plan in the ‘50s didn't include none of the vaccines that today are included, - there are seven vaccines that a creature should received during the three months of life -, it would be a serious error for the doctor or the nurse not to apply those seven vaccines to the baby, something that 50 years ago didn't exist or only some of them existed. Interlocutor: I’m understanding what you want to tell me. Ruanel: Then, while the technique goes improving, there is moral obligation to correct that person's deteriorated health. Interlocutor: Is the case of Terry Schiave karmatic? Ruanel: Yes, it is karmatic. Interlocutor: Only Karmatic in her person? Ruanel: No, because her relatives are also involved. Interlocutor: If it were not a karmatic issue, could the apparatuses be removed? Ruanel: Morally not. If you have a beloved relative in a state, let us say not a vegetative state, but a state of deep unconsciousness, if the electroencephalogram marks cerebral activity, you would always continue with a hidden hope of recovery. And this is the hope that her family has and for that reason they want to keep her alive. Ruanel: No, not her husband, he started another relationship again. Interlocutor: But what is his intention? Ruanel: He wants to avoid the media attention because that is what he thinks there is in this case. Interlocutor: And what happens with the 10% of the spirit of Terri Schiavo? Is it unconscious? Ruanel: No, her 10% is fully conscious, but prisoner. Interlocutor: I don’t understand. Can’t she take astral trips? Ruanel: When I say prisoner I don't mean that her spirit is like in a cage without being able to move. Undoubtedly she can take astral trips without any problem! the spirit cannot be trapped by anything material. Interlocutor: At this time what is her 10% spirit doing? Ruanel: Her 10% communicates at all moments with the 90% spirit, they exchange ideas and all those things. Interlocutor: Then, the only thing that the 10% cannot make is to be integrated definitively with the 90% and to be a 100% pure spirit? Ruanel: Correct, as long as there is no brain death, the 10% is necessarily connected to the planet. Interlocutor: Do you mean that when the spirit is incarnated it is like divided? I refer to the example we give always of the bar through the lock, being 10% inside and the other 90% out of it, so it would not be completely exact. Ruanel: The example is okay because it gives the correct idea that it is always the same spirit. Interlocutor: But that spirit has independent life. Interlocutor: And could we improve the idea saying that the part of the bar which is inside the lock is thinner and more flexible, in order to not give the idea of something solid? Ruanel: Yes, it is acceptable, adding that one part cannot access to the place where the other is. Interlocutor: Okay. 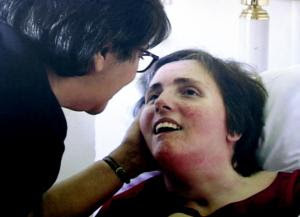 I Continue with this case, What if Terri Schiavo had some moment of lucidity and she asked them to disconnect the apparatus that keeps her alive? Ruanel: Morally not, because it would be a suicide. Interlocutor: If they consented to her request, would the 10% create karma? Interlocutor: Can you perceive the karma that this person has? Of course, I mean to the lesson that she has to learn. Ruanel: Not at this time, it would be necessary to deepen it and there is no time to do it because the vessel is very tired. Interlocutor: I think that perhaps she buried somebody alive or something similar. Ruanel: Don't forget that karma is not the law the law of an eye for eye. Interlocutor: But could it be? Ruanel: Yes, it could be, but don't speculate. Interlocutor: Okay, Master, I accept with resignation the end of this session, but to conclude, I want to ask you if my thetan is helping me or he is leaving all the work for you. Ruanel: I already know that you are kidding, but likewise I tell you that you don't have to be unfair with your thetan because he is collaborating permanently, and sometimes, as you say on planet Earth, he pinches you to put pressure on you. If it were not for his help you would not have achieved many things. It is a great merit the one that your thetan has. Interlocutor: I’m glad to hear that. Master, I have projected to summon in some session to the Master Jesus to complete the web page that I have with his messages. Can I? Interlocutor: Can I summon him directly when I come to the session or do I have to intention him previously? Ruanel: You can summon him directly. Interlocutor: I would like him to give us some shocking revelation like the one related to the genetic code of the species. Ruanel: Your intention was already received by the Master Jesus. You have work to do. I leave all my Light to all of you. This entry was posted at Thursday, March 04, 2010 and is filed under assassinations . You can follow any responses to this entry through the .